Embark on your Pacific Island Adventure on one of our exotic Vanuatu Cruises. Home to over 260,000 people, Vanuatu has been a favourite destination for Australian travellers for many years. With a long list of options, your Cruise to Vanuatu could entail a South Pacific Island Hopping Adventure through a number of Island destinations including Fiji, Noumea and New Caledonia. Our Last Minute Vanuatu Cruises could have you sailing sooner rather than later! The climate in Vanuatu is tropical. Warm and hot rainy weather from December through to April - Dry from June through to November. The official Currency is the Vanuatu Vatu (VUV). Cruise Ships to Vanuatu dock at Port Vila’s commercial pier (3km from the town centre). 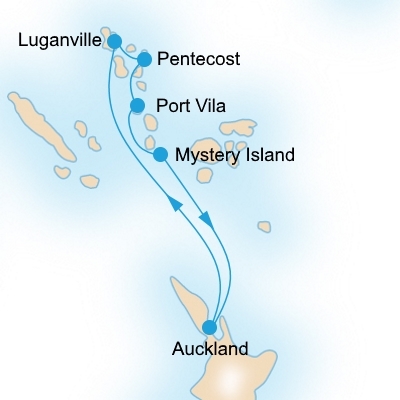 P&O has a number of Cruises to Vanuatu from Sydney, Melbourne, Brisbane & Cairns passing through South Pacific Islands such as Noumea, Lifou, Mare, Isle of Pines, and Mystery Island. Another option is to cruise hop through the South Pacific on a departure from New Zealand for your Auckland to Vanuatu Cruise. Carnival also operates a number of Cruises from Sydney to Vanuatu. Take your pick from a 10, or 11 night Cruise through the South Pacific taking in New Caledonia, and Fiji. Princess Cruises offers varied options to Vanuatu departing from Sydney, Brisbane and Melbourne. 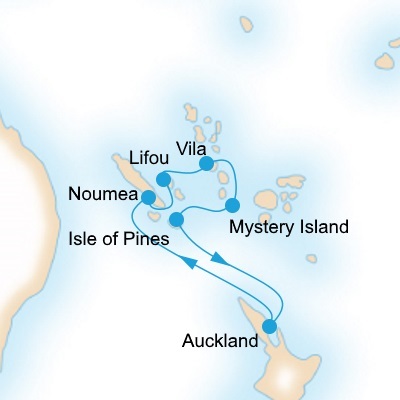 A 15 night Melbourne to Vanuatu Cruise travels first to Sydney, then onwards to Noumea, Fiji and Vanuatu. Short Cruises to Vanuatu depart Sydney for 10 nights or Longer 20 night Cruises can also include a Papua New Guinea (PNG) option. Royal Caribbean operates Sydney Cruises to Vanuatu including shorter 8 night options for those with limited time. Longer Cruises are also on offer. The Shops in Vila are some of the best you'll find in the South Pacific. Don't forget your credit card! Cascade Waterfalls is a 50 metre high waterfall in a stunning rainforest environment. Worth the walk as it is one of the best swimming experiences you'll ever come across.